A Climate Realist’s (not so) short Answers to Hard Questions About Climate Change. Question 8 (of 16) How much will the seas rise? – Len Bilén's blog, a blog about faith, politics and the environment. A Climate Realist’s (not so) short Answers to Hard Questions About Climate Change. Question 8 (of 16) How much will the seas rise? Justin Gillis answer to Question 8. How much will the seas rise? “The real question is not how high, but how fast. The risk is that the rate will accelerate markedly. If emissions continue unchecked, then the temperature at the Earth’s surface could soon resemble a past epoch called the Pliocene, when a great deal of ice melted and the ocean rose by something like 80 feet compared to today. A recent study found that burning all the fossil fuels in the ground would fully melt the polar ice sheets, raising the sea level by more than 160 feet over an unknown period. My answer to Question 8. How much will the seas rise? During the Pliocene epoch the water levels were about 80 feet higher than today, temperatures were 1 to 3 degree C warmer, but the CO2 level was less than 280 ppm, so there must have been another cause for the high temperatures than Carbon dioxide. My guess is that the activity of the Sun and the Milankovitch cycles triggered the meltdown of most of the Greenland and part of the Antarctic ice sheet. This is not the case now. We are well into the bog generating phase of this interglacial period, the Minoan optimum temperature ( at 260 ppm CO2) did not trigger the ice-melt, and ever since we have been in a downward temperature trend. 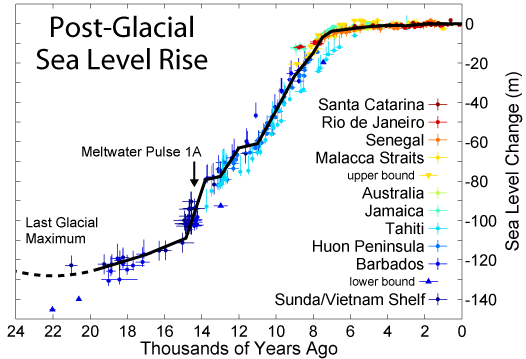 What is remarkable about this period is how stable sea levels have been. The ocean levels have been rising at an average rate of about one inch per century, quite different from emptying out the Baltic Ice Lake, an event that rose Ocean levels by feet per year until it emptied out, the rest formed what is now the Baltic Sea. Coming out of the ice age rose Ocean levels about 400 feet, and then it stopped. There are places in northern Sweden where the land still rises out of the sea at about 3 feet per century. The Mid-Atlantic ridge is rising, has plenty of undersea volcanoes, about one third of all undersea volcanoes are between Jan Mayen and Svalbard. All this displaced water has to go somewhere, and so most of the rest of the world’s coastlines are experiencing rising sea levels. This is especially true for the U.S. East coast, sinking of its own. The warming of the oceans are vastly over-estimated, being confined to the surface and the upper 1000 feet, the sunlight is absorbed in the first few feet of water and there is limited and very slow mixing of deep water with surface water. 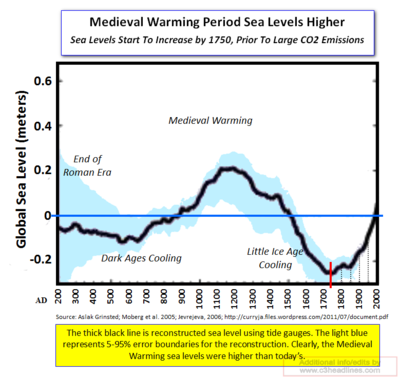 But there is a temperature dependence of sea levels, the sea levels were fluctuating with temperature, as the chart to the right indicates. 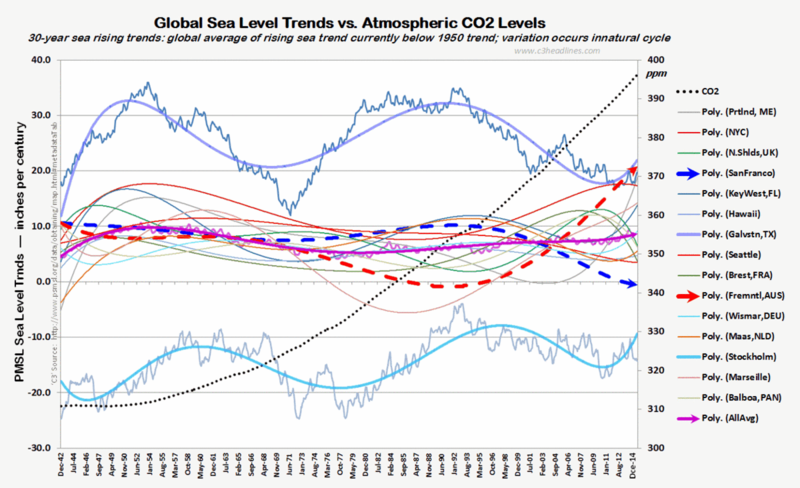 The take-home from this chart: Sea level rise has nothing to do with CO2 level rise, it is more about tectonic plates movements and what happens on the sea floor. Previous Previous post: A Climate Realist’s (not so) short Answers to Hard Questions About Climate Change. Question 7 (of 16) Will a tech breakthrough help us? Next Next post: A Climate Realist’s (not so) short Answers to Hard Questions About Climate Change. Question 9 (of 16) Are the predictions reliable?